Well signs of life in the chinook department at last! 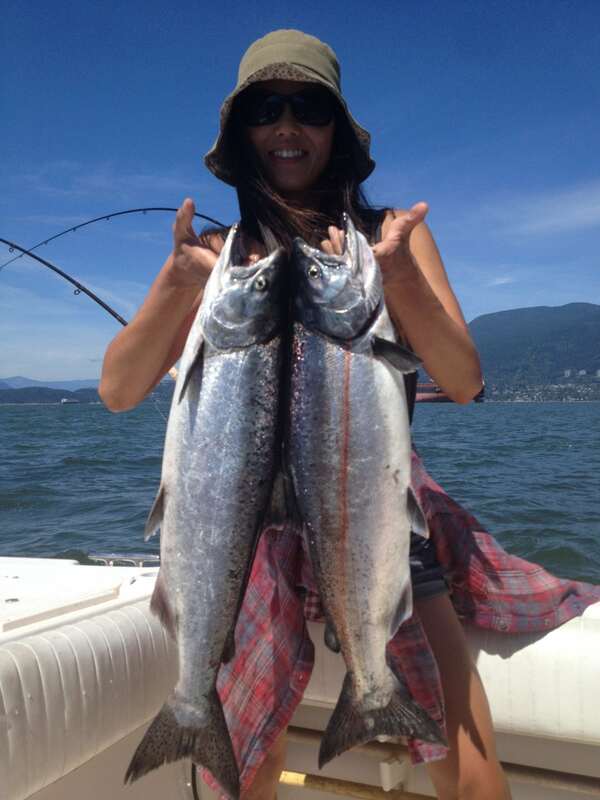 Right on que things perked up this week with more Fraser bound chinook starting to enter our waters. We had some good fishing at the Bell Buoy on Saturday last weekend with Eddie boating 3 and Jason boating 3 as well. 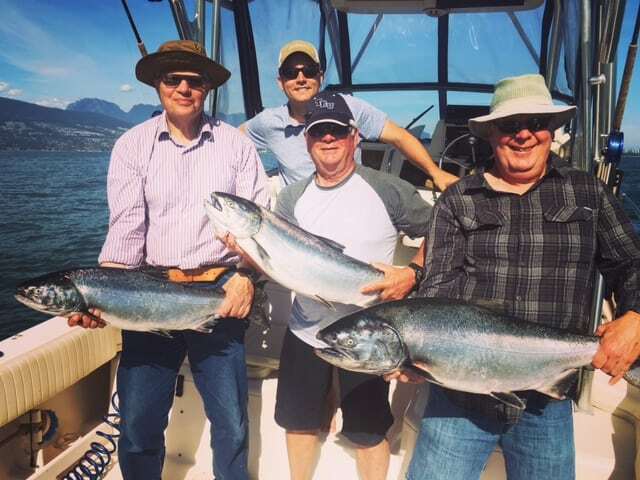 Sunday was a bit slower but the winds backed off early in the week and we were able to take our 10 hour charters to the South Arm of the Fraser and it paid off. 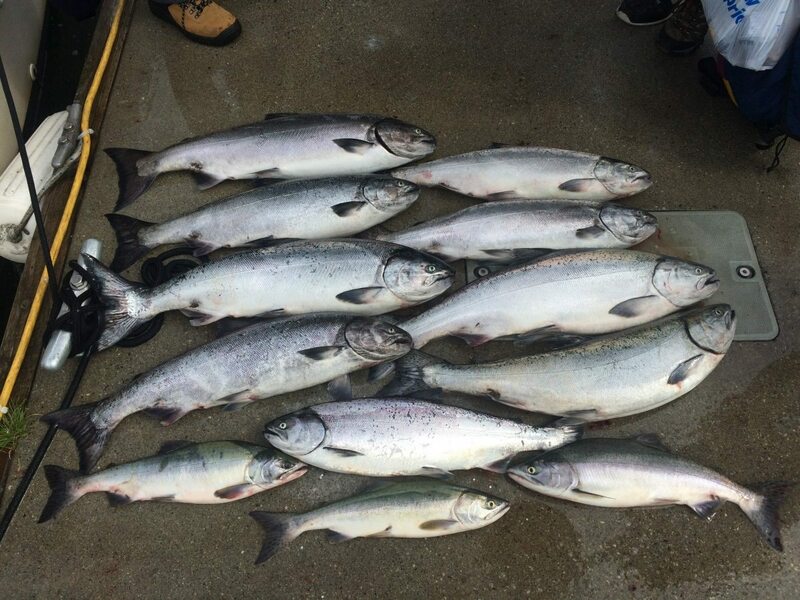 All our boats had multiple hook ups on Fraser chinook. As I am writing this report at 5:30 pm on Thursday night, I just got a text from Griffen and he just boated 2 chinook off the Bell Buoy on the flood tide, so they are coming in! Make sure you know where you can and can’t fish when you are fishing off the North Arm, T-10 and South Arm. You have to make sure you are fishing in a little deeper waters so you are outside the closed areas. To do so please go to last weeks report for details on the closure including descriptions of the closed area and GPS co-ordinates. We have talked to DFO and we fully expect them to be patrolling the area to make sure you are not in the closed area. The marine approach area is closed to protect sockeye. In a nutshell they don’t want anglers hooking sockeye. If you are fishing for chinook this is very unlikely as we fish bait and sockeye don’t hit bait often , they like small pink hootchies as most of you know. If you do happen to hook a sockeye, don’t net it and release at the side of the boat with the outmost care. 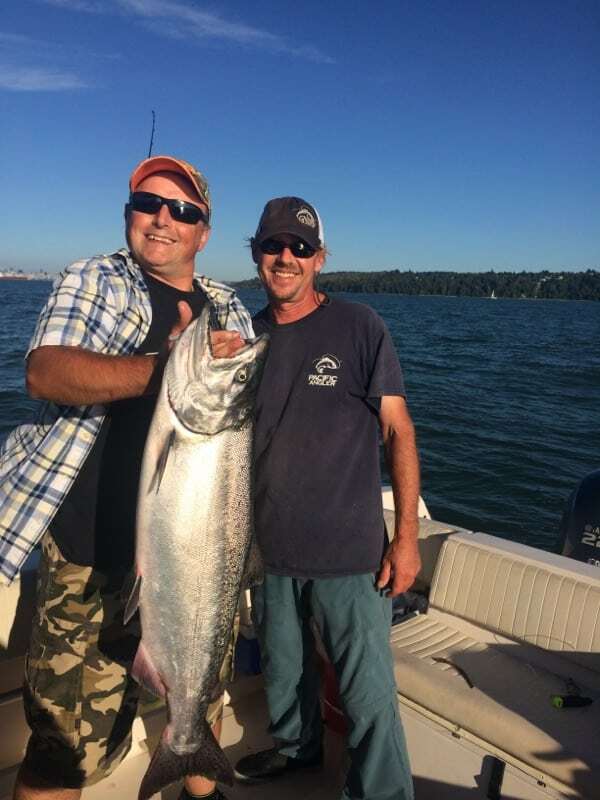 Eddie’s guests with a big Bell Bouy chinook! Anyways, back to the fishing. As mentioned before, all our guides, Griffen, Eddie and Jason have been into chinook this week. The Bell Buoy has been producing on our 5 hour charters and on the 8 hour and 10 hour trips we have gone to T-10 and South Arm but the winds were very strong this week so most days we were stuck to the Bell. Even there it was rough on some days and some people got a little sick! That’s what happens when we have big tides and big winds, pretty normal for August , but there were also some days where the winds didn’t show up and the fish were biting. Such is ocean fishing for chinook. It is a moving target to say the least. As usual, the chinook have been 30-80 on the downriggers. Also as usual, bait is king. Anchovy or herring in a glow green or glow green, chartreuse teaser head 6 feet behind your favourite glow flasher will get fish in the boat. Some of our favourites are the Salty Dawg, and Green Onion Glow. On our top rods, like your 30 rod, we have been doing well on chrome finishes as well. The water has been fairly clear most days, for the Fraser area anyways, and a Betsy flasher with a chrome teaser head with some green, chartreuse, or blue on it has been slamming some nice fish. Three nice chinook taken at the Bell Buoy last Saturday by Jason and his happy students from the Mastering Local Saltwater Salmon Fishing Course. If you don’t have bait, run out of bait, or don’t fish bait, you should. If you still don’t or can’t fish bait the second best things is a glow green spoon or a glow chartreuse sparkle back hootchy. More specifically on the spoon side of things, try an Irish Cream, Homeland Security, Flaming Hans, Gut Bomb, and Leprechaun. 5 foot or 6 foot leader and apply herring or anchovy gel scent if you haven’t. Scent is key for chinook, so if you aren’t putting scent on your spoons and hootchies you should be. For hootchy leader length try 32-40 inches. So the chinook are in, get baited up and get out there! I wil be out all weekend as the Derby Master for the Vancouver Chinook Classic, so if you see me ripping around at high speeds in a 30 foot zodiac, that is me! I will be a blur! The tournament had a record number of entries this year, so if you are interested next year make sure you sign up early as next year we are going to have to cap the number of boats! Last year the Vancouver Chinook Classic faced some extremely harrowing weather. With any luck we paid our dues and this year the weather looks amazing! Sun, heat and relatively low wind is in the forecast and we think the fish will also cooperate. We had some of the first sold reports from the bell buoy and around the corner in our charters this week and we expect it to continue into the weekend. If you are not signed up for the tournament it is not too late. We have set a record for participants this year but you can still call in a late entry. Tournament details are here.